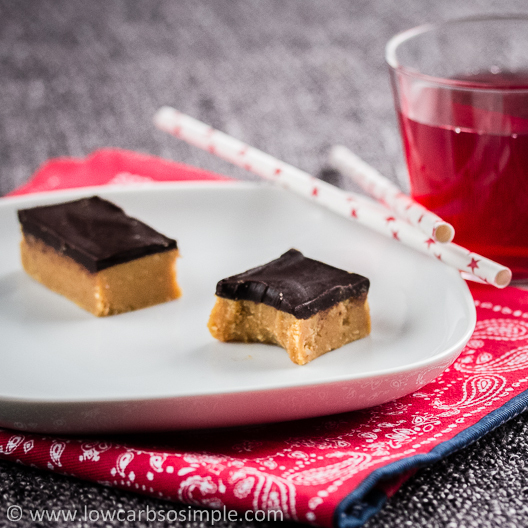 Palatable Peanut Butter Bars | Low-Carb, So Simple! -- gluten-free, sugar-free recipes with 5 ingredients or less | Low-Carb, So Simple! These are easy bars to make, although it takes some time to make them. You can sift in the sweetener if you want guaranteed lump-free result. Bars made in 9 × 9 inch (22.5 × 22.5 cm) baking dish will be quite thick. If you prefer thinner bars, you can use 9 × 13 inch (22.5 × 32.5 cm) baking dish. I wanted to keep the consistency of the bars quite soft which means that they melt in higher temperatures. It might be a good idea to serve them in the cool time of the year rather than in the middle of the hottest summer. If you are trying to lose weight I simply don’t recommend to make these bars. Yes, you read that correctly. First of all, the bars are highly addictive, so you easily eat more than you have planned. Secondly, they contain quite some calories. Please take into account your individual tolerance for carbs and calories. But let’s check how to make these enormously and deliciously palatable bars. Let’s start with the peanut butter layer: First, combine 1 cup (240 ml) of each ingredient — except chocolate — in a medium-sized saucepan. So, you need 1 cup (230 g) butter, 1 cup (240 ml) peanut butter, 1 cup (240 ml) almond flour and 1 cup (240 ml) sweetener. Heat over a very low heat, mixing constantly. Don’t use too high heat, the mixture might burn and the bars will taste horrible. Mix until everything is melted. Pour the mixture into glass or ceramic baking dish. I didn’t have 9 × 9 inch (22.5 × 22.5 cm) baking dish so I used my Ikea baking dish for these bars. Refrigerate for a half an hour or maximum an hour. If you let the peanut butter layer set too long, the chocolate layer might come loose when cutting and eating the ready bars. Start preparing the chocolate layer 10–15 minutes before taking the baking dish from the fridge. Combine the rest or the ingredients, so 1/4 cup (55 g, can be 60 g, it’s not that exact) butter, 1/4 cup (60 ml) sweetener and 4 oz (115 g) chocolate in a clean saucepan. Heat over a very low heat, constantly mixing until everything is melted. Pour the chocolate mixture over the peanut butter layer and spread evenly. You can also make decorative swirls with a fork if you like. Place the baking dish in the fridge until the layers are properly set. Cut into bars and serve. For the best taste, take the bars from the fridge a half an hour before serving. Combine 1 cup (8 oz = 230 g) butter, 1 cup (240 ml = 240 g) peanut butter, 1 cup (240 ml = 115 g) almond flour and 1 cup (240 ml = 95 g) sweetener in a medium-sized saucepan. Heat over a very low heat, constantly mixing until everything has dissolved. Pour the mixture into 9 × 9 inch (22.5 × 22.5 cm) glass or ceramic baking dish. Place the baking dish in the fridge for 30–60 minutes. Start preparing the chocolate layer 10–15 minutes before taking the baking dish from the fridge. Place the rest of the butter (1/4 cup = 55 g), the rest of the sweetener (1/4 cup = 60 ml = 30 g) and the chocolate in a clean, medium-sized saucepan. Take the baking dish from the fridge and spread the chocolate mixture evenly over the peanut butter layer. You can also use fork to make decorative swirls. Place the baking dish in the fridge and let set, preferably overnight. I’ve been planning to make my own version of peanut butter bars so long that I couldn’t hold myself anymore. I was googling ideas for my recipe and found recipes for many great treats. I didn’t want to bake my peanut butter bars but make an easy no-bake version. A wonderful recipe which I finally adapted to my needs was this one from Allrecipes.com. As sweetener I was planning to use my favorite, powdered Zsweet, which is a combination of erythritol and stevia. But how to replace the graham cracker crumbs? I wondered if almond flour would work. I wasn’t willing to waste delicious low-carb cookies to my peanut butter bars, rather eat the cookies as they were. I didn’t want to use too much time for planning, but just was persisting in getting into action and just test my ideas in practice. In my first experiment I combined 1 cup (8 oz = 230 g) butter, 1 cup (240 ml) peanut butter, 1 cup (240 ml) almond flour and 3/4 cup (180 ml) Zsweet in a saucepan and heated the mixture until everything had dissolved. I poured the mixture into a glass baking dish and placed the dish in the fridge. Immediately after that I started to prepare the chocolate layer. I combined 1/4 cup (2 oz = 55 g) butter, 1/4 cup (60 ml) Zsweet and 4 oz (115 g) dark chocolate chips (72 % cacao) in a clean saucepan and heated the mixture until everything had dissolved. I didn’t want to use peanut butter for the chocolate layer since I wanted to keep the flavors of chocolate and peanut butter separate. They would have more than enough time to combine in my mouth. The chocolate mixture was rather liquid and I poured it over the peanut butter layer — which actually hadn’t set at all yet. Luckily the layers didn’t blend. I let the whole thing set in the fridge for overnight and excitedly tasted my first ever peanut butter bar experiment on the next day. I was astonished. The bars tasted seriously good! I started analyzing what really was good in them and what I could make even better. The bars could have been slightly sweeter. Zsweet gave its cooling effect when I tasted the melted chocolate mixture, but I didn’t feel it in the ready bars anymore. I thought it was safe to add more. Almond flour was a good choice, it gave a slight crunch but not too much to my taste. I was wondering how really smooth-textured bars would taste. Maybe I could try to replace the almond flour with coconut flour, which has really fine texture? I made still quite many experiments where I added more sweetener, more almond flour, replaced part of the sweetener with liquid stevia or reduced the amount of chocolate. My final experiment — with which I was most satisfied — was quite close to the first one, just 1/4 cup (60 ml) more sweetener. I still replaced the almond flour with coconut flour to see if I get smooth-textured peanut butter bars without too mealy texture and too coconutty flavor. The bars were superb, the coconut flour made the texture nicely smooth. I still tried different quantities of coconut flour to find the ideal amount. It was really hard to decide whether to make the texture smooth with coconut flour or a bit crunchy using almond flour. Finally, I tilted towards the crunchier texture and chose almond flour to this final recipe. I also tried to make a vegan version of these bars by replacing the butter with extra virgin coconut oil. The texture and the taste were marvelous — simply unbelievably good — but the bars melted very easily when taken to room temperature. So, if you are after vegan food and planning to eat your peanut butter bars straight from the fridge, making them with coconut oil instead of butter is not a bad idea. You can see one of these bars on a turquoise plate in the photo below. I have to confess that I simply had to taste sugary and unhealthy Reese’s cups to compare them with my bars. I didn’t check what artificial stuff Reese’s had, but they tasted pretty weird. Sorry, but I’m just not used to them. Even I like this recipe very much, I think I’ll continue making more peanut butter bar experiments in the future. If you are not a fan of strong-flavored dark chocolate, you can replace it with decent sugar-free milk chocolate or semisweet chocolate. The carb count might change, though, depending on the sweeteners used in the chocolate. If you like vanilla, you can add 1 teaspoon organic vanilla extract to the peanut butter mixture. My favorite tweak is to add 1 teaspoon caffeine-free instant coffee granules to the chocolate mixture before heating. Smooth-textured peanut butter bars can be easily made by replacing the whole amount of almond flour with 1/2 cup (120 ml) coconut flour. It’s important to sift the sweetener for the smoothest result. And, if you prefer even crunchier bars, you can use crunchy peanut butter. Just check that it is not sweetened. I think this was my first ever recipe with peanut butter. These bars were so tasty that I hope to publish many more low-carb recipes with peanut butter in the future! Thank you!! These are setting up in my fridge right now. I can’t wait to taste them. I think they will be the perfect treat for this low carber for Christmas. Hi Tammy, I would expect that coconut oil would work as well. Hi Shannon, thank you for your comment and welcome on board! The idea of adding coffee to peanut butter frosting sounds intriguing, I think I’m going to try out that as well! Can i substitute xylitol for the sweetener? Kristina: yes, as long as you use powdered xylitol. Xylitol crystals or granules might feel gritty in the ready bars. Hope you like the recipe! These look delicious! I am wondering, have you ever tried to make a peanut butter and jam bar? One that is low carb and gluten free? I’m looking for a good recipe for those! Hi Kathy! Thanks! I’ve got several ideas with peanut butter and jam, so I might publish a recipe for the bars in the future. I just have to experiment first and do some serious testing. These look just like a high carb, high sugar fudge I used to make and after trying your pumpkin muffins and cinnamon bites I can’t wait to make these later today. I’m sure I’ll love them but I’ll let you know. Thank you so much for all the work you do! Thank you for all your work on this site. I really enjoy reading the recipes. I get very interested in peanut butter and chocolate ones especially. I have intended to make a recipe and either don’t have time or an ingredient. I am trying to get my low carb pantry together. thanks. Robin, thanks for your comment and your kind words. Great to hear that you like to read my blog. If you ever try my recipes in practice, please tell me how you like them! Wow, thank you for this. I am going to make this soon. I have all the ingredients. For some reason I really crave that chocolate peanut butter flavor and with Halloween coming up this will be a big help. Last year I didn’t eat any Halloween candy and I want to repeat. Hi Andrea, wonderful if my recipe answers your needs! Hope you like these peanut butter bars!